I was devastated and felt guilty – feeling it was somehow my fault, she was an amazing bird with a personality I had never seen before and I took her death very hard. The following week after her death (early Sept)I was at our local pet store getting rabbit food, I purposely did not go near the bird section – we were just starting to learn more about pet sales in stores and where these babies actually came from and vowed never to purchase any animal from one. How many of us have said that against our better judgement… As I was leaving I heard this little voice – “peekaboo” – and I turned around, and there sat this little green bird in a small enclosure doing everything he possibly could to get my attention. The clerk walked over and said what a charmer he was and would I like to hold him? NO NO NO my mind screamed, don’t do it – but of course I did. He immediately stepped up and planted a birdie kiss on my nose – as I snuggled him – burying my nose in his soft feathers, the tears flowed like water, oh how my heart ached for my lost Sunny. For many weeks after that visit, I continued to “pop in” and visit with him, there he sat, trying to get others attentions but none were captivated. I think I visited 3 times a week for almost 3 months! Close to Christmas they told me that a couple was interested in him and he was not biting them as bad as all the others(apparently a negative side to his personality, but never once, did he ever bite me)and after the mandatory 3 visits, he would go home with them. Visit one was complete, visit two was the following day, and the last visit would be on Christmas Eve. My heart was heavy that day as I knew it would be the last time I saw him. I bought a few toys for him to take along to his new home, and once again, the tears flowed heavily as I said goodbye and gave him a final kiss. 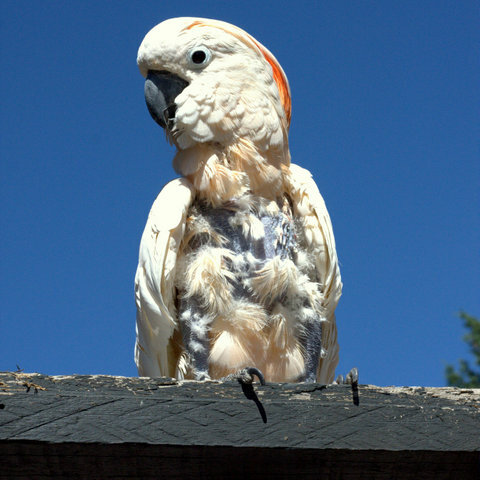 My family knew I had been visiting this bird, and even came along a few times to meet him, they told me I should just take him home already – but his price tag was steep and I didn’t really want to buy a pet of any kind, from a petstore. The next day I woke up with pneumonia, had lost my voice and was incredibly sick, and even while tending to a raging fever, and doped up from so many meds, I couldn’t get that little green bird out of my mind, but knew he was on his way to his new life within a few days. Christmas came and went in a drug induced blur for me. Boxing Day! The day for champions and those silly enough to stand outside in freezing temps to save money, being sick I chose to stay home in bed. Later that day I am woken up to my kids telling me to wake up, close my eyes and open my hands, they have a special gift for me. I’m sick and really just want to be left alone!! I give in with a huge sigh as the door opens and my family walks in. My son says “someone wants you” and I feel a light feathery touch on my hands – and there, in the palm of my hands, sits the little green quaker who I thought was gone forever…needless to say the surprise was incredibly overwhelming and to this day, I still cry when I remember..
Fast forward 4 years – Seymore lived up to his quakertude with charm and pizzaz – he learned how to talk – sing Twinkle little star, do flips/tricks and showed us what an incredibly smart bird he really is!! Being a food junkie, we always had to watch his diet and encouraged him to eat more pellets than anything else – in hindsight – that was a blessing – as it ended up saving his life! 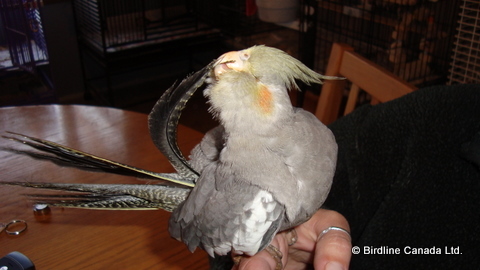 By this time Birdline was in full swing as a non profit and we had ½ a dozen rescue birds in residence, one of these birds was Lucky – a Greater Sulphur Crested Cockatoo (his story next). Not incredibly aggressive in chasing other birds, but he would lunge if they got to close him. This particular Sunday morning was quite busy, my daughters step kids were over, we were preparing for a baptism and it was busy. All the birds were out and Seymore was with me, it was time to leave so we started putting birds in their cages. 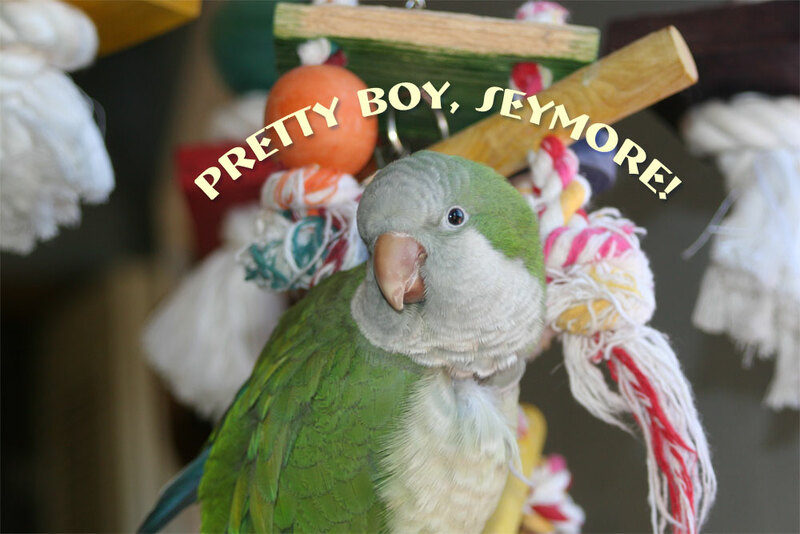 As I rounded the corner, Seymore didn’t want to go in, so he flew off – in the direction of Lucky..my world stopped for the briefest second as he flew directly at the food bowl – Lucky reached up – snapped at him – and with horror and shock, I watched as Seymores beak landed in the food bowl. I screamed in utter terror as Seymore flew in the opposite direction – by that time everyone came running. As I picked Seymore up and turned him around, I screamed again – where his beak used to be was a gaping hole – I was hysterically crying, screaming OMG OMG NO NO NO – we need to get to the vet NOW. We got Lucky back into his cage, loaded up Seymore, and drove to an emergency clinic affiliated with our vets. Words will never be able to express what I was feeling at that very moment, all I knew was that he was going to die, how could a bird survive this?? Once they examined him, they said it was a clean bite, not a jagged or tearing bite so the sinus cavity was protected, the biggest problem was in getting him to eat – he could no longer crack seeds/millet or pick food up – and inside I’m crying -dear lord, what kind of life is that for him?? They said we could euthanize him or take him to our vet the following morning. I wanted one last night with him…they instructed me how to give him fluids via syringe – pain meds – antibiotics and we went home..Seymore was still in shock and unable to sit on his perches, and when he fell, he couldn’t get back up – he couldn’t grab with his beak – heartbreaking to watch beyond words. I changed out his cage and moved things around and eventually he went to sleep. The following morning I found him on the bottom of his cage attempting to pick up pellets, he was hungry!! My tears continued to flow as I felt his frustration, and the fact his life was forever changed. At our vet clinic we spoke at length about the pros and cons of euthanization or moving forward with rehabilitation. We chose to try – we had nothing to lose – and he had a strong will to live! The next month was incredibly challenging!! I had to learn how to feed him every two hours to keep food/water in him until his upper beak either started growing back – even a little – and the lower beak would grow out to form a scoop. His cage had to be modified for him and yet he continued to fall – toys had to be removed as he tried to play with them, but couldn’t chew/bite and the chewing aggravated the injury causing it to bleed. And eating? Turned out to be the easier than we thought. As I mentioned earlier, the fact he ate pellets, saved his life! These pellets were turned into a mash and syringe fed every 2 hours to ensure he was getting water and food, throughout that month, Seymore was with me at all times, if I went out, he came along in a carrier – family functions – he was there – as the weeks went on, we were able to add mashed foods to the syringe and increase the amounts he ate – he continued to gain weight(he lost A LOT of weight)and for all intense purposes was back to his normal self once again, with the exception of having no beak. The months that followed continued to be challenging for him. His toys had to be soft with no chains/bells or anything hard that would aggravate his injury. The cage had to be modified so that he had no need to climb as he couldn’t hang on to anything, and as the months continued to go by, he continued to fight through it. We noticed some growth coming back on the upper beak and the lower beak by this time was starting to also grow out into a scoop shape allowing him to pick up bigger pieces of food. At the 6 month mark, we cried tears of joy as he ate a piece of millet for the first time since the accident! From that day forward, he continued to progress and over the months we were able to add back his favorite toys, add more food to his diet and he continued to amaze us with his resilient personality. As of today – Seymores beak has grown back about ½ way since the accident 3 years ago. Its doubtful it will ever grow all the way in, when you watch him play/eat now you would never know hes missing his beak until you look at him. He learned how to hold his pellets, dunk them and let them get mushy in his lower beak, and his tongue became his tool for manipulating food around. The lower beak grew out and now almost meets the upper beak allowing him to once again be able to climb, crack some seeds and yes, even try to bite. Seymore became handicapped due to a terrible accident that could have been prevented, I will always carry guilt because of it, but it has also taught me a valuable lesson in regards to clipping or not clipping certain birds. God gave them wings to fly, but in certain homes/circumstances, in order to keep them safe, clipping may become necessary. His sheer determination and will to live kept him alive and his strength and ways of adapting to his handicap are an inspiration to me and every single bird that comes in with a handicap whether it be physical or emotional. Seymore taught me how to be selfless, love without condition and to keep trying even when I feel like giving up. 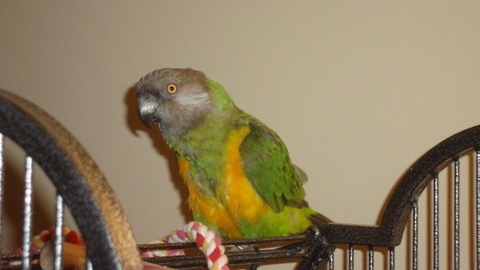 March 15, 2014 – Seymore died in a tragic house fire at Birdline along with 26 other companions. Words cannot express how devastating his loss is and we miss him and his antics each and every day. My little “poopy booger head” mommy will always love you..